Carers save the UK an estimated £132bn a year (Carers UK, 2015), the cost of running a second NHS, so why are they given such little support? Paying out to support carers, to enable them to continue caring safely, is better than waiting until they become ill themselves or are no longer able to care for their loved one anymore. After all, the cost of an urgent care package or care home fees is far more than a support and respite package would ever cost. So what happens when a carer becomes sick? We have so little preparedness for situations like this and you can almost hear the groans of local authorities and clinical commissioning groups as they’re left with the task of arranging – and paying for – alternative care for the person being cared for. It makes us feel like burdens and it makes us feel sad that, in ours and our carer’s hour of need, no one wants to take responsibility and help. You see, I have lived this. I have experienced what happens when a carer gets sick, and I can tell you, it’s the most stressful and upsetting thing in the world. I am 22 years old and suffer from numerous complex health conditions which mean I am disabled, seriously ill and life-limited. I receive all my nutrition and fluid directly into my bloodstream via a line into my heart (total parenteral nutrition). I also have a PEG tube draining my stomach continuously, and an ileostomy and a urostomy. I am in a wheelchair and forced to spend the majority of my time in bed. Until recently, my mum had cared for me 24/7 since my health deteriorated when I was 14. Although we also had care workers come in, they couldn’t care for all of my needs, namely the medical ones, meaning that mum never got a proper break. As nobody would provide nurses to care for me at home, it all rested on mum. Even in hospital mum needed to stay with me and perform all my care as not all ward nurses are trained to use my line and they don’t have time to meet all of my complex needs. Last April, mum was diagnosed with a benign, but big, brain tumour. She needed surgery urgently, so we had three weeks to sort out a care package for me. We turned to the local CCG, whose ‘solution’ was to place me in a care home. The only two that would provisionally take me were an older person’s home or a care home for people with a learning disability. Going into either home would’ve meant I wouldn’t be able to go out at all, not event to visit mum in hospital, and I wouldn’t be to do my charity work or see my assistance dog in training, as these were all considered unnecessary luxuries. I wouldn’t even be able to attend my own hospital appointments unless I could prove each one was urgent and vital to my immediate survival. We fought with the CCG until they finally put together a care package for me; even then, the package was only for six weeks as they felt mum would be well enough to care for me again by then – within just six weeks of major brain surgery! The package started the day mum went into surgery, so I’d had no time to get used to and comfortable with my ITU (intensive therapy unit) nurses and overnight care workers beforehand, or to iron out any problems. I was thrown in at the deep end, with complete strangers caring for me, at an extremely stressful and difficult time.I had lovely nurses, but it was exhausting having to explain every detail of my life over and over, correct any mistakes, organise shifts with the agency to fit round my appointments, and find people to take me to the hospital to visit mum and for my own medical appointments. Everything mum had done for me, I was now doing myself. Following mum’s surgery, which was a success, she sadly had a stroke. To see my mum not aware of much, unable to speak or communicate, was very distressing. Mum always cared for me, and now I was feeding her lunch, putting lip balm on her, supporting her – talk about a role reversal! 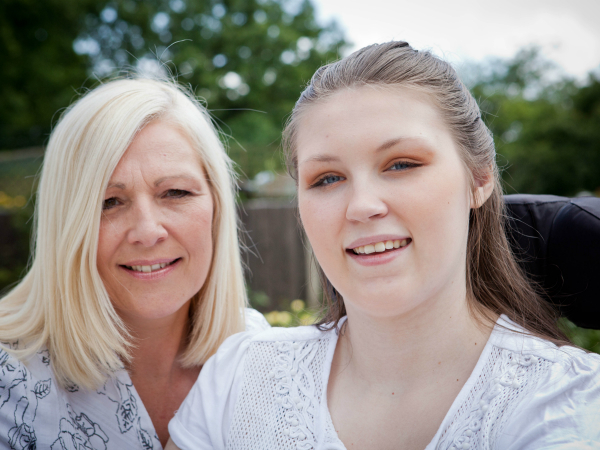 Mum’s had a very lengthy recovery – she’s come so far, but she still struggles. It’s just as well we fought so hard for the package I have which, unsurprising, has continued beyond six weeks. Why did mum not get the support and break she needed? Why did it take this tragedy to get a care package that meets my needs? This is where I think the system fails. We hear about patient-centred and personalised care, our right to choose our treatment, and a shift towards care in the community. Yet proposing to send a 22-year-old woman into an older person’s home, removing her from her friends and family, is not patient-centred care. My case has proven that patients like me can be managed in the community – that unique packages like mine can be built and that they can work and are a viable option. It’s not right for everyone, but it can be done. I will soon transition from a package funded by the CCG to a personal health budget, where I will be able to get the same hours of support from an ITU Nurse and overnight care worker, and that I am in control of. I can choose and employ my own staff directly, so I can make sure the nurses are suitable and are prepared to do the things I want to do. I cannot wait for that. I want to share our story because I hope it will enlighten those in power to the struggles faced by carers and the person they’re caring for, challenge the way we think about unpaid carers, and above all, lead to discussions that could ensure the system better supports people in need of care and the unpaid carers who look after them. Lucy Watts received an MBE in the New Year’s Honours List in 2016 for her work on health and disability, and with charities. Lucy has numerous complex health conditions, which mean she is disabled, seriously ill and life-limited. You can read more of Lucy’s blogs here. Find out more about Carers Week 2016 here. Sadly welcome to life dealing with any CCG. We’ll perhaps a bit harsh but I genuinely can’t recall many ready or positive examples of working with them and in previous role in learning disability services I would often hold my breath that someone didn’t get CHC finding just because of how unresponsive and narrow minded the Cate would be (e.g. all about just being ‘nursed’ in the traditional sense and sod everything else though it’s clear that in such instances that health become responsible for SOCIAL CARE which is more then just care homes). Perhaps a mass generalisation but can only go on what I see and arguably can you expect more when medical model is left to its own devices? I am not saying either that LAs are perfect but this is the sort of thing that worries practitioners when full integration (lead by health) is seen as the answer to everything.